Are there any statistics on how many mallard ducklings survive? 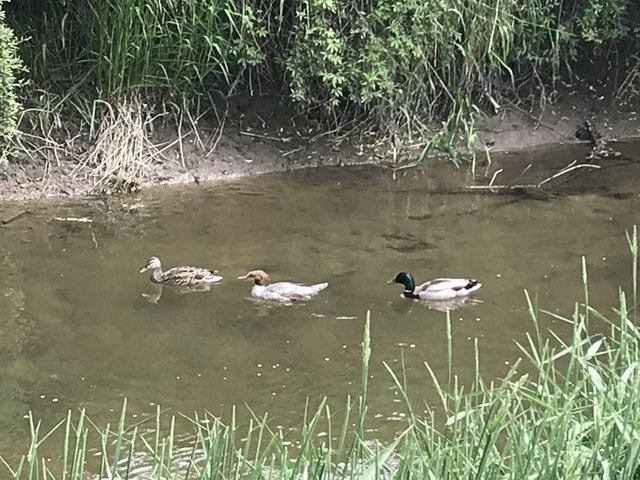 In addition to all of the ducklings currently around the area, one will also see mallard ducks without, (the mallards would run the duck with a red head off if they had ducklings). Lots of other animals such as foxes will eat ducklings, are there any statistics as to how many ducklings survive. My assumption is that there are duck pairs that had ducklings and then lost all of them, as in the picture. I would say between hatching to able to fly. There is indeed data on mallard duckling survival, which in retrospect is not that surprising given the number of wildlife biologists and the interest of fish and game departments in the number of ducks. In 2014, we investigated mallard duckling survival on different pastures relative to a suite of characteristics pertaining to the adult female, clutch, brood, weather, and habitat. We monitored 438 ducklings from 50 radio‐marked females to 30 days post‐hatch. Duckling survival was unaffected by pasture type but increased with duckling age, the presence of ephemeral water, and with greater distance from the nearest anthropogenic structure. Survival was lower for broods of second year (SY) females than for broods of after‐second year (ASY) females, in areas with more dense cover, and when ducklings moved, on average, greater daily distances. Cumulative 30‐day duckling survival ranged from 0.11 for ducklings of SY females without ephemeral water present to 0.46 for ducklings of ASY females with ephemeral water present. Note that is only for the first 30 days. Survival of ducklings to 30 days was 0.42 at Oakwood (95% CI, 0.13-0.67) and 0.77 at Mickelson (95% CI, 0.42-0.92). Mean 30-day duckling survival across sites was 0.40 (range 0.07-0.50). In a stable population any breeding pair will, during the course of their lives, successfully raise two young who successfully breed themselves. Of course there's no such thing as a stable population, so you can only talk about long term population stability. In the UK the mallard conservation status is amber. However given that there seem to be an extra 15,000-30,000 breeding pairs over 20 years ago the practical answer is "slightly more than 2" in their lives. Not the answer you're looking for? Browse other questions tagged united-states ducks or ask your own question.